Rural development through irrigation along the great River Murray had become an accepted practice in the 1880s and beyond. However, there was less appreciation of the complexities of the working needs to convert the land – the massive task of constructing weirs, locks and channels and, above all, great storages to hold sufficient water for the growing irrigation. The searing drought of 1902 brought about protests from the rural areas. A movement which spread from Kyabram formed along the Murray Valley and pressed the urgent need to create water storage and distribution facilities so that farmers might enhance the productivity of the land and protect their interests. The need for more effective catchment storages became evident. As water was channelled to more farms, the regions’ agricultural output increased steadily. People on the land felt cut off from the decision-making in the cities that was shaping their lives, and they demanded that greater attention be given to their needs. Their concern found expression in meetings in Narrandera and other centres, where the need for additional water along the Murrumbidgee and other rivers was discussed. It was understood that a comprehensive effort in river control was needed to achieve improvement in rural conditions and sustainability. When the men of the Murray Valley met at Yarrawonga in 1944 to form a regional body to achieve cohesive Valley policies, many had in mind the enlightened example of the Tennessee Valley developer, David Lilienthal. The chairman of the Tennessee Valley Authority, who declared in 1943 that decentralisation provided greater opportunity for a richer, more interesting, and more responsible life for the individual, and to increase his genuine freedom, his sense of his own importance. The Yarrawonga gathering came at a turning point in thought and inspirations. WWII had opened new horizons in technology and had enlarged ideas about ways to achieve progress, both nationally and at the individual level. Lilienthal’s emphasis on building a community of capable and progressive people through the release of individual enterprise at the local level, struck a responsive chord. It was time for these visionaries and the engineers to meld their minds. When they did so, the concept of turning the Snowy River’s waters westward began to advance steadily from fantasy to credibility, from rough draft to fulfilment. In the early stages, the idea of making greater use of the Murray’s bounty was an inspiration to perceptive individuals who were not daunted by fear that their resources might fall short of their hopes. All irrigation before the water’s regulation was based on the principle of available river flow and ignored the vagaries of a climate that in one year might send down a flood and in another leave the river so reduced that a child could cross it on foot. Nevertheless, the locking of the river as a means of maintaining a reasonable level of water gained wider attention over the years. The first to urge action were not irrigationists but riverboat operators. Soon arguments were raging in New South Wales, Victoria and South Australia about who owned the Murray. The three-cornered argument about ownership and authority to utilise the Murray’s waters could not be simply resolved. Separation left New South Wales in legal possession of the stream over most of its length, but Victoria had seen the potential of irrigation with it’s waters and set about drawing off what was needed. South Australia sought to keep the river at a level that would allow navigation to continue and consequently opposed moves upstream that might reduce the river’s flow. Long before irrigation brought the matter to a head, proposals were advanced for the improvement of the River Murray system. In 1893 representatives of the three interested colonies met in Melbourne, and the conference turned its attention to the matter of 'locking' the great river for the purpose of aiding navigation. Some years later, efforts were made to devise a plan for this purpose, but only South Australia made any practical moves (beginning in the early 1870s) and their effect was minimal. Meanwhile New South Wales denied that South Australia had any claim to the waters of the Murray; since no tributaries entered within it’s territory, South Australia had to be satisfied with whatever flowed across the border - the argument ran. The first concerted attempts at conservation in New South Wales followed the establishment of a Royal Commission under William Lyne in 1884. The report released in 1887 proposed a system of canals north and south of the Murrumbidgee, to be fed from an offtake a few miles below Wagga Wagga. The main result of Lyne’s work, however, was the setting up of the water conservation and irrigation branch within the Department of Agriculture. Many forceful legislators had spoken out on the need to develop the Murrumbidgee, where Samuel McCaughey had demonstrated some of the possibilities by undertaking his own prime development of irrigation at North Yanco. A technical investigation established the feasibility of constructing a major storage on the Murrumbidgee below it’s junction with the Molonglo. The men of the Murray were not idle. With the increasing demands being made on available water, a genuine conflict of interests arose and the matter of apportioning the Murray’s waters grew more urgent. Water conservation and irrigation bodies in New South Wales and Victoria in the 1880s set rules for the use of water but did little towards assuring supplies. Federation brought a change of outlook, and extremely dry conditions throughout the Valley in 1902 made the issue a pressing one. The River Murray Main Canal League organised a conference at Corowa to discuss the future of the Murray, and invited Prime Minister Edmund Barton and the premier of each of the three river states to attend. The government leaders decided that a Royal Commission should be set up to investigate “the conservation and distribution of the Murray and it’s tributaries for the purposes of irrigation, navigation and water supply”. The Commission’s report recommended joint control of the Murray by the three states concerned, with the Commonwealth playing a supporting role. It also established that, in view of the limited water resources of the continent, irrigation should have priority over navigation in matters related to storage and control of water. Political pressure for a better deal for men on the land in Victoria came from the Kyabram Movement. Victoria responded to the call for development of water resources, but the Commission’s report on harnessing the Murray was pigeonholed. The drought that reduced the Murray to a mere trickle in April 1913 reawakened interest. An interstate conference of engineers went over old ground and its report again stressed the importance of irrigation and conservation of the Murray’s waters. This time the need for action and not worlds was underscored when the river all but dried up in the searing 1914 drought. The Commonwealth’s active involvement was confirmed in the River Murray Waters Act of 1914, passed by Federal Parliament and agreed to by the three interested state parliaments. The act provided for the creation of the River Murray Commission (now the Murray-Darling Basin Authority) as a permanent body to give effect to the agreement. The River Murray Waters Act was welcomed throughout the Valley as the first step toward enhancing the great river’s bounty and assuring a fair sharing of it. The River Murray Commission was not a constructing authority in its own right but with the power to supervise the provisions of the agreement reached among the river states and the Commonwealth. The commission was to see that certain basic requirements were met – including the supply of South Australia of an agreed minimum of water. The amount was to be sufficient to fill Lake Victoria once each year and, with the aid of water returned from Lake Victoria, to maintain specified levels in the lower river. This in turn guaranteed 603,000 acre-feet a year for diversion from the Murray for use by irrigators in South Australia. Subject to meeting these requirements, the Murray’s flow at Albury was to be shared equally between New South Wales and Victoria. Control of tributaries below Albury was vested in the state concerned. The commission set about initiating a comprehensive program of works along the river. 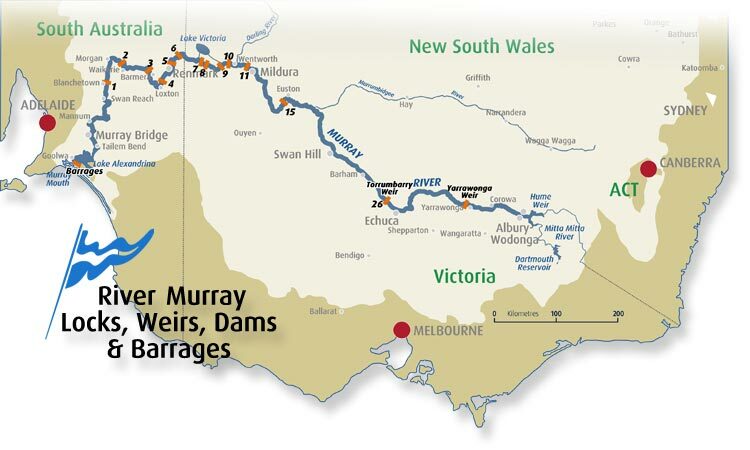 It was agreed that Victoria and New South Wales would jointly undertake the task of building a major storage on the Upper Murray as a basic means of regulating river flow. 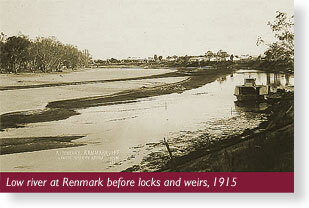 As a joint effort, the three states agreed to construct 26 weirs and locks (a total of 14 were constructed) on the Murray and 2 flood diversions were constructed instead of the original 9 weirs on the Murrumbidgee to maintain navigable waters all year round for over 1600 km – from the river’s mouth near Goolwa to Echuca and, on the Murrumbidgee as far as Hay, Lake Victoria, a natural storage within New South Wales would be used to hold waters for South Australia’s use. South Australia, as anxious as ever to keep the river trade alive, moved quickly to construct nine weirs and locks on its section of the great river. 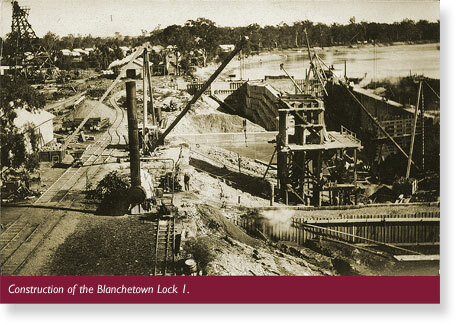 South Australian Parliament had already authorised the construction of the weir at Blanchetown and work had begun in 1913. The design, which was later applied to Locks 2 to 10, was recommended by Captain Johnson of the USA Corps of Engineers who had been engaged by the South Australian Government in 1912. With those constructed at Wentworth and Mildura, they assured a navigable depth of two metres along 1000 km of river. However, the move came too late to save the riverboat; by the end of World War I the motor car and truck were already beginning to provide new mobility and ease of transport, and it was accepted that no more weirs and locks should be built; instead, efforts would be concentrated on providing additional storage capacity in the system. As shown in the table below, weirs 1 to 10 were constructed between 1922 and 1935. Each weir has a lock constructed next to it, to facilitate navigation. A spur to this objective came from the wartime experience, which confirmed Australia’s importance as a food and fibre producer and demonstrated that with assured markets there was scope to expand rural production. The Murray region, with its eminent diversity and scope for development, became the focus of attention; with augmented water supplied its irrigation areas could produce more bountiful crops and offer greater security than almost any other section of the continent. The vision of filling the Valley with more and more farming families had the community’s blessing. Closer settlement, with soundly-based family farms, became part of the national objective of providing wider opportunity for individual advancement and building up the nation’s economic strength. 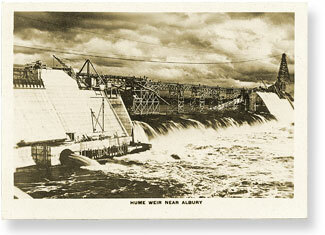 Construction of the Hume Dam, above Albury, was begun by New South Wales and Victoria in 1919. Over the next 17 years thousands of men were employed on its construction. Before it was completed, depression had stifled some of the merits of rural development. The original plan provided for storage capacity of 1,100,000 acre-feet; then it was proposed to increase the capacity to 2,000,000 acre-feet and for some time work was carried out on this basin. The Hume Dam’s capacity in the present day is 3,040 GL. When it was completed in 1936 the Hume Dam was hailed as Australia’s greatest engineering triumph and an insurance against drought and poor years. 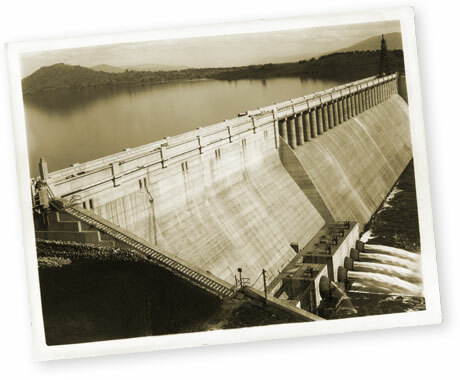 To distribute the waters assured by the Hume Dam, it was agreed in 1934 that a diversion weir should be built on the Murray at Yarrawonga, with a spillway in which steel floodgates would enable water to be held to a depth of 15 metres; allowing diversion by gravitation into two main canals capable of taking water to large areas of Riverina and northern Victoria. 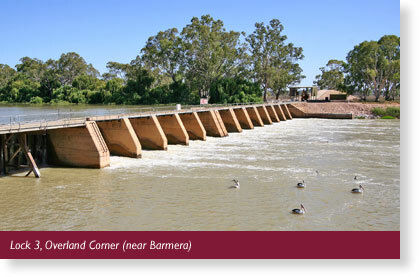 The weir was completed in 1939, along with the Milwala Canal and Yarrawonga Canal soon afterward. All other weirs have a section of permanent concrete piers half way across the river and a section of steel trestles that can be dismantled during floods. Flow is controlled by using large concrete stoplogs and small wooden planks. Construction of Barrages at the Murray Mouth was agreed to as a concession to South Australia for the omission of some of the original 26 navigation locks and weirs. Work commenced on the 4,000 GL storage at Dartmouth in 1973. Its primary function was to increase the security of water supplies (for New South Wales in particular), make additional supplies available to Victoria and increase South Australia’s minimum annual entitlement from 1,550 GL to 1,850 GL. Dartmouth Reservoir is the Commission’s most upstream storage and it is used as a reserve for dry years. Water stored in Hume Reservoir is used to meet downstream requirements in preference to Dartmouth water because there is a greater likelihood of water spilling and being lost from Hume Reservoir than Dartmouth Reservoir. Releases from Dartmouth are delayed as long as possible so that Hume Reservoir is nearly empty at the end of the irrigation season. Naturally the series of locks and weirs has dramatically changed and effected the flow of the natural river. This has changed the aquatic ecosystems, wetlands, riparian vegetation and waterfowl. With less flow to the Murray mouth the entire ecosystem has changed with serious consequences to the Coorong. The impact of man on the volume of flow in the Murray can be seen by comparing the average natural and current flows at various locations in the system. Current flows at Albury are higher than natural because of the transfer of additional water from the Snowy River via the Snowy Mountain Scheme. Further downstream diversions have reduced flows. At the Murray mouth, outflows to the sea have been reduced by 8,100 GL/year which is almost two thirds of the natural outflow. This reduction in flow is slightly less than the current total diversion from the Basin of around 10,500 GL/year 1. As the changes in the flow regime have impacted on the Murray mouth, barrages have been constructed to keep the inflow of sea water out of the fresh water lakes of Lake Alexandrina and Lake Albert. Under natural conditions there was almost always some flow out of the mouth. These outflows were sufficient to keep Lake Alexandrina quite fresh for extended periods. Studies using the MDBC’s models indicate that under natural conditions the Lake would have been generally fresher than it is currently, although with occasional periods of high salinity. This is consistent with the fact that in the 1800s the Lower Lakes supported a thriving Murray Cod fishery. The development of irrigation reduced the summer and autumn flows sufficiently to change the nature of the lakes. By the 1930s the lakes were supporting a salt water fishery. The barrages were completed in 1940 and separated Lake Alexandrina from the Coorong. 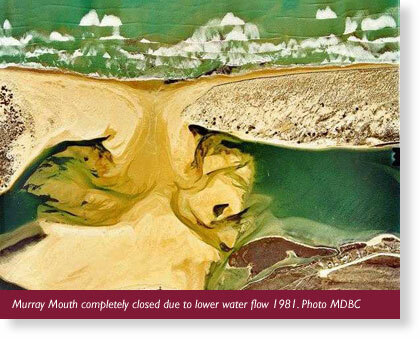 This reduction by a third of outflows to the Murray mouth has seen the channel between the Coorong and the sea silt up completely. A new channel was cut only when the river subsequently flooded. This has a severe impact on the ecosystem in the Coorong without natural waterflow. It appears that closure of the mouth is likely to be a reasonably regular occurrence in the future unless an additional 1500GL/year are allowed to flow directly to the mouth uninterrupted. Before the major storages were built there were a few occasions when the River Murray stopped flowing and became a series of water holes. In 1915 for example, flow in the Murray below Swan Hill ceased from February through to May. Similarly in March 1923 the Murray dried up just upstream of the Murrumbidgee junction. Under current conditions it is expected that there will always be some flow in the Murray. Weir 9 also raises the water level high enough to allow gravity diversion to Lake Victoria. Water is pumped for both irrigation and for diversion to major urban and industrial centres including Adelaide, and the 'Iron Triangle'. A lock is a simple design; a rectangular chamber of concrete with gates at each end. The locks permit boats to move from one level to another. Locks similar to those of today were first used on the Grand Canal in China during the eighth century. In the fifteenth century, Leonardo da Vinci is reputed to have designed the first lock with the familiar pair of mitred swing gates at each end. This is the type of lock which is used on the Murray. The gates close to form a 'V' against the current and upstream water pressure helps to keep them closed and make a watertight seal. The pressure of water within the lock chamber keeps the downstream gates closed. 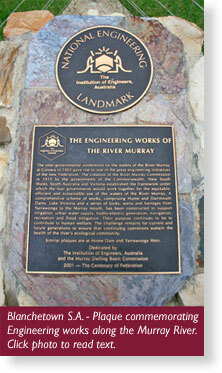 The designs for the locks, and all of the weirs on the Murray, except Mildura and Torrumbarry, were developed by Captain E.N. Johnston of the United States Corps Engineers. Mildura weir and the first Torrumbarry weir were designed by John Dethridge of Dethridge wheel fame. a sluice section consisting of openings between concrete pylons which are normally closed by stop logs. The stop logs are removed during floods to minimise the interference to flow. The storage capacities upstream of all of the weirs are relatively small: less than 2% of the storage of the largest storage on the River Murray system, Dartmouth Reservoir. With the exception of Weir 6, Murtho, the weir pool of each storage extends to the storage upstream. Therefore, the River Murray between Blanchetown and Wentworth is more like a series of lakes than a lowland river, particularly when river flows are low. During periods of low river flow, the rivers are operated to maintain a relatively steady upstream pool level for irrigation, water supply and navigation. The weirs are designed to be stripped during floods. This involves the complete removal of the weir structure except for the concrete columns. The cranes used to carry out this work are moved to specially constructed elevated areas where they will be above the 1% flood level. When the weir is stripped the lock is inoperable and a navigation pass is established. The navigation pass is a section next to the weir where steel 'A' frames are used rather than concrete columns to control pool level. To establish a navigable pass the weir is removed and the 'A' frames are laid horizontal providing a section with sufficient depth to allow safe passage of vessels. Due to the different location of the weirs the flow at which it is necessary to 'remove' the weir varies. The approximate flows at which the weirs are removed and reinstated are outlined in the following table. Reinstatement of the weirs is a critical event as floods in the lower Murray are characterised by a very fast reduction in flow rate. This means that if the reinstatement of a weir is delayed, the time required to refill the weir pool is significant. To overcome this, the weirs are reinstated as early as possible while the flow and river level is high. The reinstatement of the weirs is also coordinated to ensure that any refilling of a weir pool does not result in a sudden drop in flow downstream, affecting the timing and refilling of downstream weir pools. Purpose: originally built to provide year-round river navigation for commercial cargo boats and for irrigation diversions by pumping or gravity. Today the commercial cargo trade has disappeared, but the weir and lock continue to serve the original irrigation function and are increasingly important for recreational boating. Blanchetown is 135 km north-east of Adelaide on the Sturt Highway, the main road up to the Riverland towns of Waikerie and Renmark. It began life as a stopover point and watering place for mail contractors and carriages carrying passengers in 1855, on what was then known as the Sydney road. Blanchetown's cliffs line the river on both sides and are most famous for the beauty of their changing colours. Studded with fossils, they are also of considerable geological interest. This is classic river country, with lagoons, wetlands and a backdrop of vineyards and grazing land. 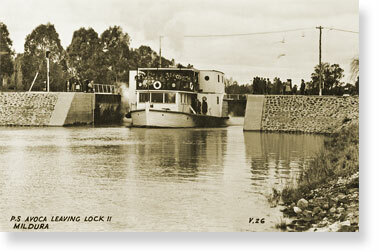 The Blanchetown lock and weir – the first on the Murray – was completed in 1922. (The last one completed at Euston, near Robinvale, in 1937). It was named the William R. Randell Lock, after Captain William Richard Randell, the first river boat captain to navigate the River Murray in 1853. The structure consists of three basic sections; a lock chamber, a navigable pass and a sluice section. The lock chamber provides navigation during normal river flows. The lock is a simple design–a rectangular chamber of concrete with gates at each end–allowing boats to move from one level to another. The inside of the lock is 83.8 metres long by 17 metres wide. That gates are made of steel and are coated with tar epoxy. The seals are rubber. The weir is a so-called Boulé type, formed from one metre square wooden panels slid vertically down between needle beams and collapsible trestle frames. At 168.85 metres, it is the widest weir on the River Murray. It has an upper pool level of 3.3 metres and a lower pool level of .75 metres. The weir includes a navigable pass made of steel collapsible trestles supporting Boulé shutters which can be withdrawn and the hinged trestles collapsed onto the floor of the channel in times of flood. It also includes a sluice section consisting of openings between concrete pylons which are normally closed by stop logs. The stop logs are removed during floods to minimise the interference to flow. For a boat to pass downstream through the Lock, the water inside the chamber must be at the same level as the top weir pool, to allow the gates to open. The top gates are opened by hydraulic powered arms to allow the boat to enter. The gates are closed behind the boat and the water in the lock chamber is released by opening large hydraulically operated butterfly valves. The butterfly valves are only slightly smaller than an average house door. Water flows from the lock chamber, via tunnels, to the weir pool below. As the water level in the chamber drops, the boat is lowered with it, until equal to the level of the lower weir pool. The bottom gates are then opened and the boat continues on its way. The water levels in locks are raised and lowered entirely by gravity; no pumps are used. To travel upstream the reverse occurs. After the boat enters the lock chamber and the gates are closed behind it, valves are opened above the upstream gates to fill the chamber, via tunnels from the top weir pool. Water enters the chamber from the tunnels through ports spaced along the bottom of each wall. This is to distribute the inflowing water to minimise turbulence in the lock chamber as it fills. When the water level in the lock chamber is equal to the weir pool, the gates can be opened and the boat can proceed. It takes only 7 minutes to empty or fill the lock chamber but it normally takes 15 to 20 minutes to pass a boat through the lock. Six to eight medium houseboats can be accommodated in one lockage. Both diversion and storage capacity in the basin have grown steadily since the 1950s. Demand for extra water for irrigation is still strong and the demands from the Basin for the urban water supplied of Adelaide and eventually Melbourne will increase as the populations of those cities grow. Many irrigators are not currently using all the water allocated to them. In the future it is likely that this will change especially if the transfer of entitlements between irrigators becomes easier. In the northern part of the basin where the growing of cotton is possible, the last decade has seen considerable irrigation, development with the proliferation of large on-farm storages to catch unregulated flows. All of these factors suggest that diversions will increase in the future. On the other side of the coin however, there is now an increased awareness of the environmental qualities of the river and the flow requirements of the river ecosystem. There also appears to be less reluctance to use water for environmental purposes. The construction of further dams in the basin would almost certainly face considerable opposition as well as having to overcome the constraints of the law of diminishing returns. A final difficulty in predicting future trends is the flow regime of the Murray-Darling system arising from an impact through global change and the “greenhouse effect”. The impact on the rainfall patterns in Australia is not well understood at present; however, there are some indications that it will cause an increase in tributary flows, especially in the tributaries of the Darling in the north of the basin. This remains to be seen. 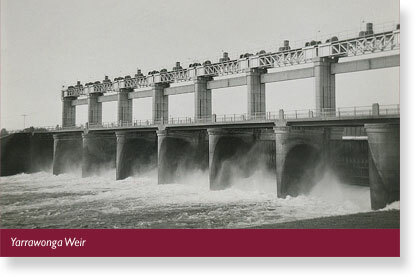 The first lock and weir on the Murray was completed in 1922 at Blanchetown in South Australia and the last was completed at Euston, near Robinvale, in 1937. 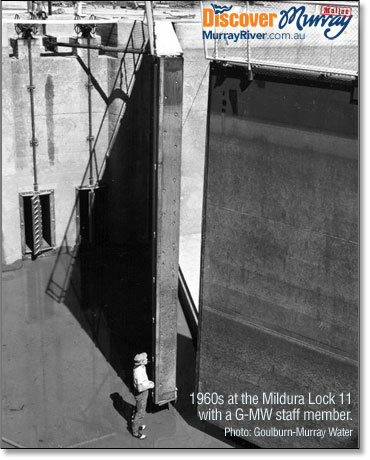 The small locks on the barrages at the Murray mouth were completed in 1940. 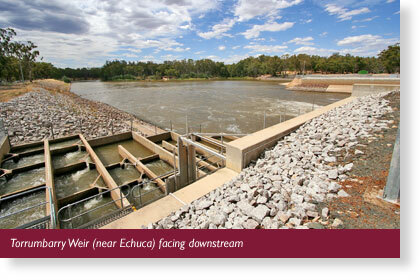 The original Torrumbarry weir, downstream of Echuca, was replaced with a new structure in 1996. The locks were generally built too late to be of benefit to the river trade as the development of railways and the growth of motorised road haulage had overtaken river transport. The resulting decline in the river trade led to the abandonment, in 1934, of the construction of further weirs and locks purely for navigation purposes. After that time they would only be constructed if the weir also assisted irrigation. Locks 12 to 14 which were to have been constructed between Mildura and Euston, and 16 to 25 between Euston and Torrumbarry, were abandoned. 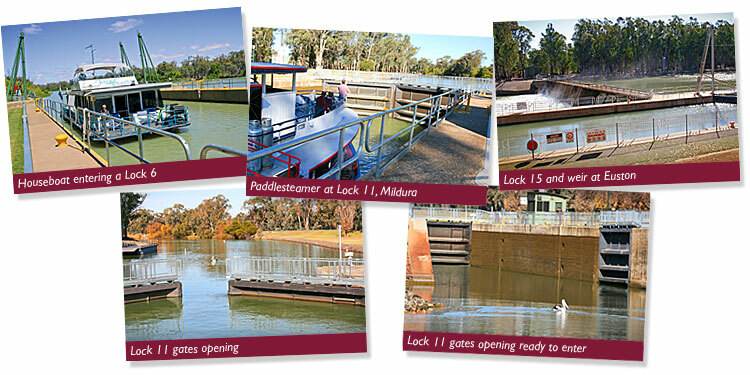 Today there are 13 navigation locks on River Murray weirs and two locks on the barrages at the Murray mouth. They are maintained and operated to serve an increasing number of houseboats, tourist cruise boats and other recreational craft. The locks and weirs on the Murray make an enormous contribution to the tourist industry in South Australia and the Sunraysia Region.